Beautiful certificate from the Edison Portland Cement Company Company printed in issued in 1908. This historic document was printed by the American Bank Note Company and has an ornate border around it with a vignette of Thomas Edison. This item has the original signatures of the Company’s President, and Treasurer, and is over 109 years old. In another venture in 1899 Edison became involved in the production of cement. He formed the Edison Portland Cement Company and used it to promote the use of cement in low cost homes as well as for furniture, in refrigerators, and a number of other items including phonographs. In the winter of 1901, the Thomas A. Edison supervised the construction of the Edison Portland Cement Company works at Stewartsville, New Jersey, near large limestone deposits. By 1905, the company produced 3,000 barrels of cement per day. 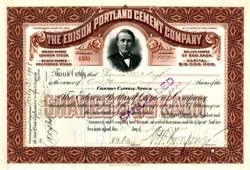 In 1908, Edison signed a cross-licensing agreement with the North American Portland Cement Company for mutual use of important cement patents. By the mid-1920s, the firm was the fourth largest producer of cement in the U.S.
Thomas A. Edison (1847 - 1931) - Born in 1847, Edison would see tremendous change take place in his lifetime. He was also to be responsible for making many of those changes occur. When Edison was born, society still thought of electricity as a novelty, a fad. By the time he died, entire cities were lit by electricity. Much of the credit for that progress goes to Edison. 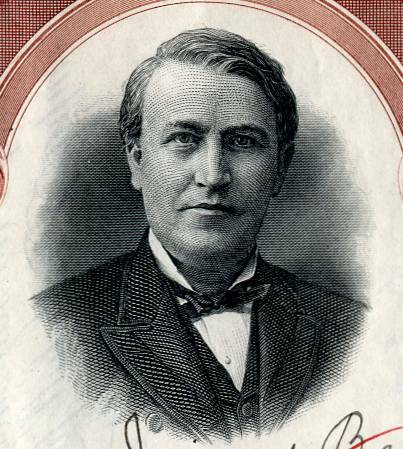 In his lifetime, Edison patented 1,093 inventions, earning him the nickname "The Wizard of Menlo Park." The most famous of his inventions was an incandescent light bulb. Besides the light bulb, Edison developed the phonograph and the "kinetoscope," a small box for viewing moving films. He also improved upon the original design of the stock ticker, batteries the telegraph, and Alexander Graham Bell's telephone. He believed in hard work, sometimes working twenty hours a day. Edison was quoted as saying, "Genius is one percent inspiration and 99 percent perspiration." In tribute to this important American, electric lights in the United States were dimmed for one minute on October 21, 1931, a few days after his death.